Three hundred years separate theartisan techniques and technical know-how used to create the aesthetics and the mechanics for the Jaquet Droz Petite Heure Paillonnée model for Only Watch 2015 and in combining them, Jaquet Droz have unveiled an exceptional and original timepiece. 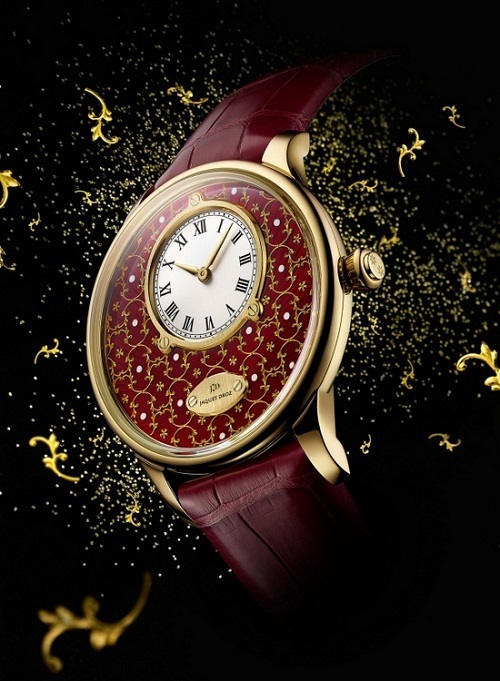 Paillonnée enameling is an ancient technique which the artists at Jaquet Droz have showcased to superb effect on the exquisite burgundy and gold dial of this special piece, created firstly by usingminiscule slivers of gold feafto form a raised motif, before the enameling process can begin building up until the perfect tone (in this case an almost edible rich burgundy) is achieved. The antithesis to this three hundred year old artisan technique is the ultra modern addition to the movement of a silicon spiral - new for the Petite Heure Minute collection. A 43mm 18k yellow gold case enhances the agreeable deep burgundy dial, and a matching alligator leather strap is the perfect accompaniment to this delightful union of gold and deep red.